I think it's fair to say that Wavelore are a company who create niche sample libraries: their first commercial product was a fully playable American Zither and, while the Kontakt‑based Pedal Steel Guitar under review here might be considered a little more mainstream, you can hardly accuse them of creating a 'me too' instrument! 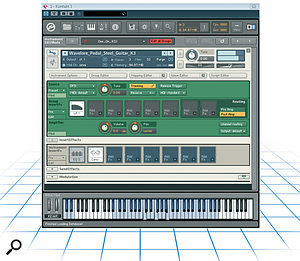 Available as a 1.3GB download, the library unpacks to 1.9GB of 24‑bit samples, and the Kontakt instrument includes eight‑way round‑robin sampling (so that repeated notes sound more natural), convolution‑based amp models with a selection of reverb and mono/stereo mic choices, and plenty of MIDI expression options. 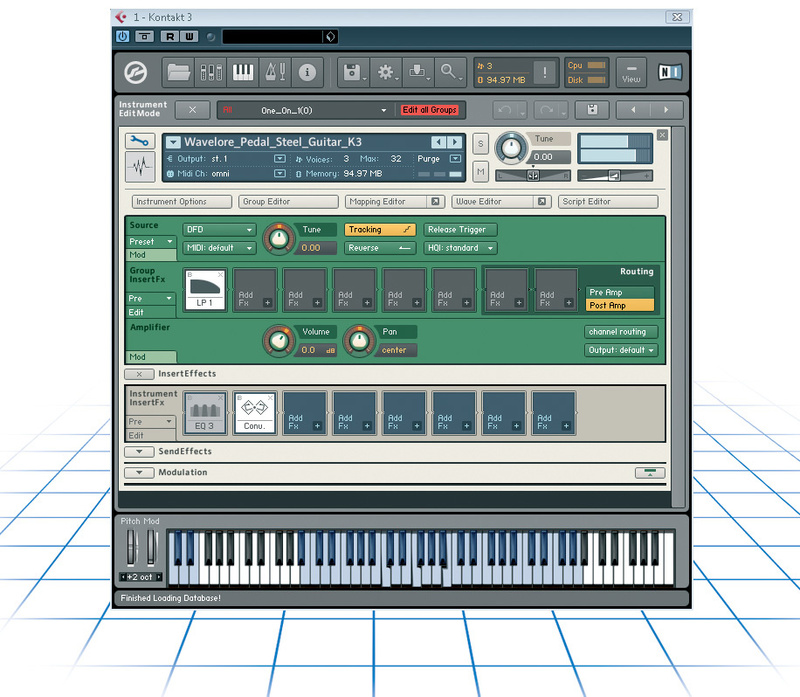 A useful PDF manual is also included but, given the rather intricate playing and keyswitch configuration, it might also have been nice to have had some example MIDI file performances that could be loaded into your host sequencer for tutorial purposes. Getting the best out of this library requires two things over and above a copy of Kontakt. First, sustain and expression pedals for your controller keyboard are pretty much essential. The sustain pedal changes the way in which samples from different strings on the pedal steel are mapped across the keyboard and, in turn, this creates different voicing and bending options. The expression pedal is used to control volume and, as volume swells are such a characteristic part of pedal steel playing, this is an important element in creating a realistic performance. The other thing that's required is some perseverance. Recreating the 10 strings of the most common pedal‑steel format in software for a keyboard to play in a way that's realistic (you can only play combinations of notes that are physically possible on a real pedal steel) requires some fairly complex sample mapping. As a result, this is not a straightforward instrument to play, and the behaviour of notes 'bending' into the next note when played legato varies across the keyboard. MIDI CC4 is also used to change 'position' on the pedal‑steel neck (to simulate the slide being placed over, for example, the fifth fret rather than in 'open' position), and this also changes which notes might bend into another. So it's complex stuff, but still probably not as complex as learning to play the real thing, and there are some useful examples in the manual to get you started.